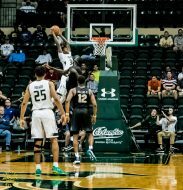 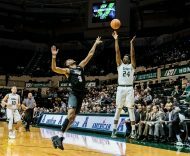 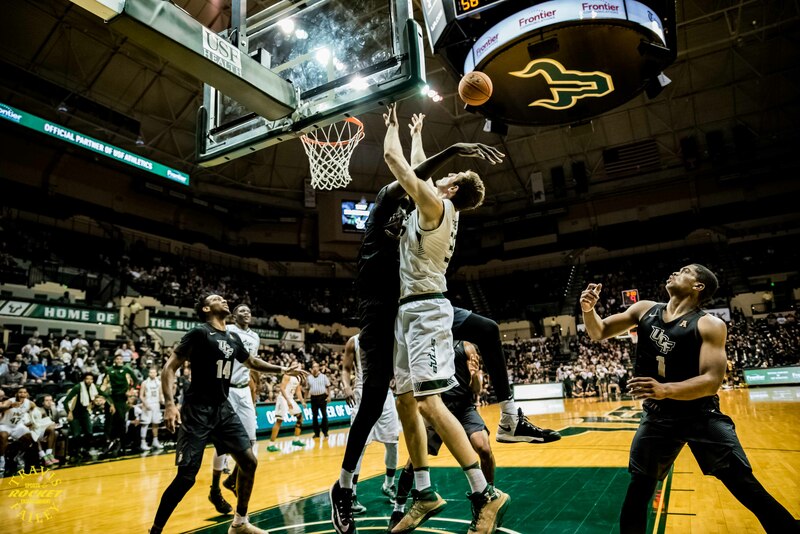 Tampa, Fla. – – The UCF Knights and their fans traveled down I-4 to to take on the USF Bulls at the SunDome on Thursday night. 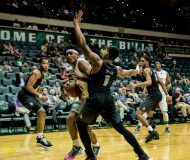 USF Bulls (7-21, 1-16 AAC), has struggled mightily in conference play this year but was looking to close the last two games of the season in a positive way. 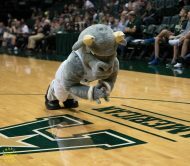 Thecrowd was energized throughout with new USF football Charlie Strong in attendance. 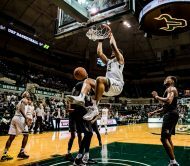 and crashed the boards throughout but in the end, The Bulls couldn’t hold the lead and fell 59-56.
the clock running towards 0:00. 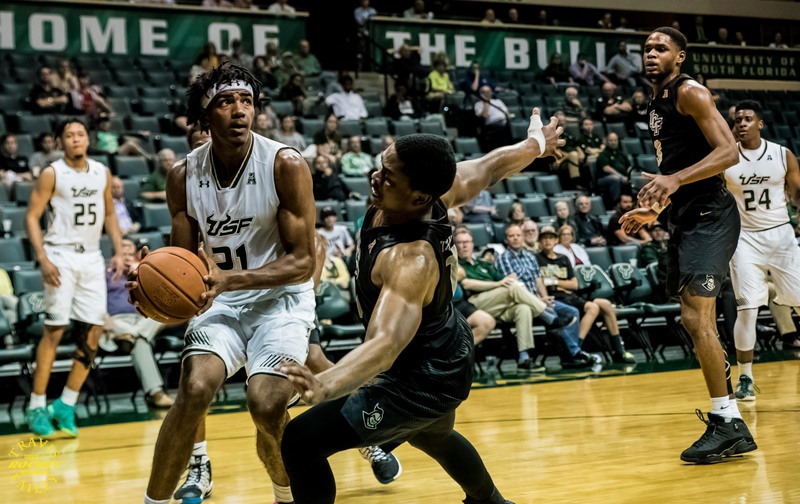 The big difference in the game was that UCF shot 9-18 from downtown and USF went 4-19. There was a great battle of big men as USF’s Ruben Guerrero (7’1) battled UCF’s Tacko Fall (7’6), up and down the court with Guerrero finishing with 6 points and 10 boards. 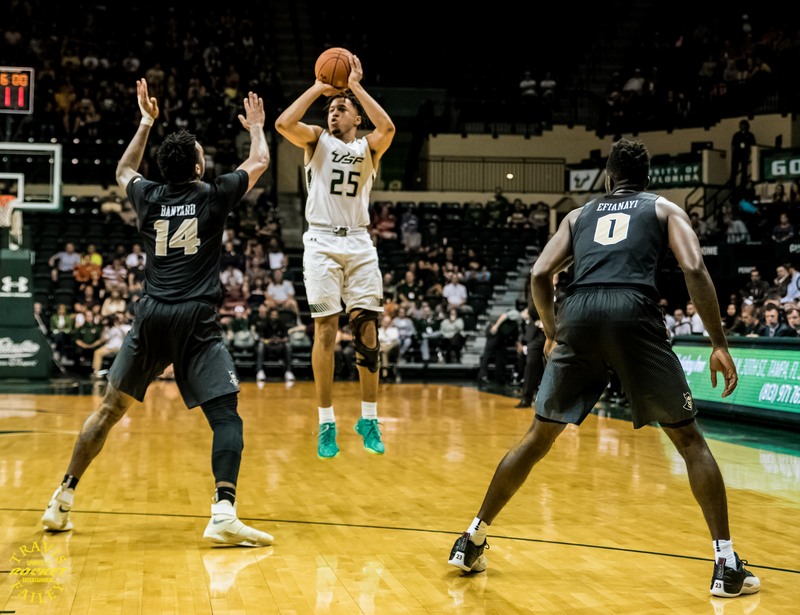 Fall got in foul trouble early and had to sit a bit in the first half but really helped by keeping USF’s guards and small forward out of thepaint and by finishing with 4 blocks. Fall and UCF’s defense really stepped up in the second half and USF struggled at times to score. 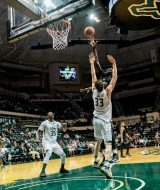 The Bulls will try to finish off their season with a win against Temple on Saturday at 2pm at the Sundome.